It was a most ordinary meeting on a rainy night-2/9/15. The new chair did fine, some good things. But the strangest thing happened that had us leaving the room. 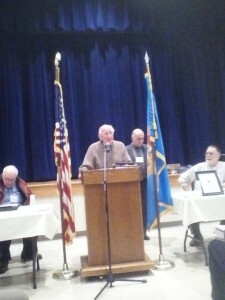 William McCully wins Republican of the month. It was the first Sussex county GOP meeting for the new chair, Vince Calabro. It went well for someone new at chairing the Sussex GOP. It wasn’t perfect. Vince needs to watch his talking, however unobtrusively, with fellow executive members while others are speaking at the podium. It’s distracting and not very professional. But we’ll allow that it was the first meeting, he was new. Calabro seems to have a fine sense of humor which will no doubt help guide his future in the Sussex GOP. A couple of public service type announcements first. 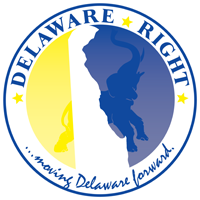 The state Republican convention is on 5/29 and 5/30 at the Double Tree hotel in Wilmington. If yon reader wishes to attend, contact the Sussex GOP to put in your name. Call 302-856-6323 for more information. Ken Currie gave a report on his committee’s efforts to create a “welcome” handout and small gift to attract new Republicans. The First State Unity Dinner, sponsored by the Sussex GOP, is on 2/28/15 at the Marvel Carriage Museum. Cost is $15.00 a person/$25.00 a couple. RSVP by 2/14/15. A couple of Republicans of the month included Fred Silva’s wife, William McCully of Georgetown and hard-workiing Sussex GOP secretary, Liinda Creasy. The thing that surprised me was the number of new EDC’s (electoral district chairs) installed. These folks were all nominated at the January meeting but they came back! Good luck to you all and I am impressed that the Sussex GOP still recruits and they keep joining. Speaking of nominating EDC’s….former Sussex GOP chair John Rieley was nominated for an EDC. Some might say….”he’s baaaaaaack”. And then the motion was made to adjourn to an executive session to discuss items that the general public guests (which would include ME) should not hear. The motion maker said, as I quite, the discussion was about a “question of privilege” and that there were people in the room who would use this discussion against them….the Sussex GOP. Then another Blogger-Frank Knotts-raised his hand, claiming his right to the one who would use such discussions against the Sussex GOP. Come on guys….you’re scared of a humble Blogger? Sure Frank Knotts is a rabble-rouser; he’s known far and wide for same. And note his fine leather trench coat and spiffy dark glasses on that dark rainy night and you got to smile. I mean what are you folks going to do…go into executive session every time you want to discuss something that will inspire Frank to write about it? Not to mention that us peons in the guest section come to HEAR what’s going on with the Sussex GOP, not be dismissed every time you want to discuss something you don’t want Frank Knotts to hear. I’ve done some research on what was discussed at that executive session because surely the Sussex GOP is not stupid enough to think there aren’t ways of getting to the answer. It’s early yet and my sources are mute. I’ll let Frank figure out what had these folks so spooked. As for me, I think it shows a cowardice that is very unbecoming to the Sussex GOP. Finally, our parliamentarian Miguel Pirez-Fabar announced he was running for a school board position. Miguel urged others to consider joining the local school boards. Congrats Miguel for joining up and doing the job. We’ll be back next month covering the Sussex GOP meeting and with hope those folks grow a pair. NEXT : We’re trying to catch up on the Sussex County Council. If not we’ll have some juicy tidbits. 11 Comments on "The Sussex County GOP…Something’s Up and We’re Reporting It Here"
The reason you don’t respond to comments is: You write gossip and make stuff up as you go.. Your writing ability is in the dumps and your mind in the gutter. You and Knotts will make a hellofva team. I don’t know if you left DP willingly or were asked to leave by management but they will do much better without you or Knotts. All the rejects go to Delaware Right. Maybe you know something the rest of us don’t, but is Fred Silva’s wife REALLY William McCully? Or do you stretch the meaning of “couple” to mean three people? In which case, how about using your investigative skills to find out what her name is? In a gay marriage, someone must be the wife. In lesbian relationships, the non-wife wears a baseball cap. Among men, the wife shaves daily. Actually, among gay (male-male) marriages there are two husbands, just as in a lesbian union there are two wives. Don’t know about the baseball caps, though. is your post supposed to be funny or insulting? i am having trouble ascertaining the tone……. on another note…. the grammar and usage in this piece are tragic. That’s an understatement there, “yon reader.” The woman can’t write and probably finally got the message at DP. It’s really sad, she must be getting dementia. A big ROTFlMAO for Delaware Right taking her in. Actually, among gay (male-male) marriages there are two husbands, just as in a lesbian union there are two wives. Then there’s no marriage, which unites a man and a woman in holy matrimony. Don’t know about the baseball caps, though. Go to Rehoboth and see for yourself. mouse, do you mean it’s a Lesbiman. Frank the self-proclaimed Lesbiman and the old bag with Alzheimer with a wee touch of dementia will not rule the roost of progressive liberals at Delaware Right.